16 tracks: The King’s Shilling * Farewell to The Gold * Rise Up Jock * Can Ye Sew Cushions * Broken Down Squatter * Isle of Haut * Catch Me If You Can * Down Where The Drunkards Roll * Ring-a-Rosie * The Weddin’ * A Man You Don’t Meet Every Day * Bonnie Susie Clelland * Edinburgh * Grey Funnel Line * Nostradamus * White Flower. 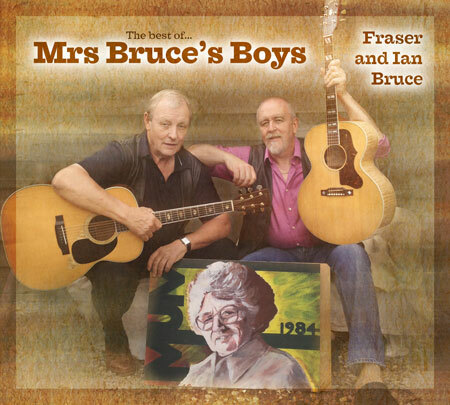 Fraser and Ian Bruce enjoyed an extremely successful period between the years 1980 and 1986, playing festivals, concerts and folk clubs throughout the UK and other countries around the world. In one year alone they appeared as a main stage act at fourteen festivals in the UK. They made many radio and television appearances plus they released three very fine albums: Mrs Bruce’s Boys Vol 1, Veil Of The Ages and Mrs Bruce’s Boys Vol 2. In those days they were on vinyl and tape, long before CDs were even thought about! The boys were becoming so busy that a decision had to be made. Fraser wanted to take on a greater challenge by setting up a specialist structural repair company whilst Ian was keen to proceed with his musical career. He was starting to write some fabulous songs and his voice was second to none on the folk scene. Ian is now a firmly established top grade artist with a series of around 20 CDs to his credit, plus a selection of songs which have become standards on the scene. He still works solo and as part of a duo with his friend Ian Walker - they released a CD & DVD Born To Rottenrow in 2014. Fraser’s business was a success but is now in the hands of his two eldest sons. This has allowed Fraser and Ian to get together again to produce and compile an album of songs from their days in the 1980s. There are ten re-mastered tracks, five re-recorded live tracks and one song never previously released. Ian Walker joins the lads on the live tracks, which were recorded in front of an invited audience in the Wee Folk Club, Edinburgh. The album includes such classics as King’s Shilling (Ian Sinclair), Farewell To The Gold (Paul Metsers), Rise Up Jock (Bob and Carol Pegg), Broken Down Squatter, Down Where The Drunkards Roll, Edinburgh (Ian Bruce), Grey Funnel Line (Cyril Tawney) and the very powerful Nostradamus (Al Stewart). The re-mastered tracks all include the best session musicians of the time and the arrangements are as fresh today as they were in the 1980s. Fraser and Ian are currently planning tours of the UK and beyond to promote the album. Peter Haigh of Peter House Studios mastered the album and design is by John Slavin of Designfolk.